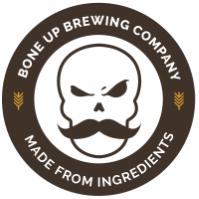 Stats: 100 - Bone Up Brewing Co.
Color: We tried for amber (again) and missed (again), but this time around it's more of a light bronze. Music Pairing (Jimbo's Choice): "Don't Stop Living in the Red" by Andrew W.K. Music Pairing (Jared's Choice): "Party Hard" by Andrew W.K. Best Occasion to Drink: While trying to convince somebody else to do the grilling for you because you're feeling too lazy to get up. Brewers' Notes: Whenever we brew a farmhouse ale, we get questions like "farmhouse ale? What's that mean?" and the simplest answer is "basically nothing" but nobody seems to like it when we say that. But nevertheless, this is a Special Occasion beer and we decided that we needed to fill it with our favorite things! And for us that means local grains (from Blue Ox in Maine) and local hops (from Four Star Farms in Central Mass) and oats and rye and house-made candi syrup and an extra little pinch of Bone Up Pixie Dust. This one punches a bit above its weight, so don't be surprised if it leaves you unexpectedly glued to your chair. Cheers!